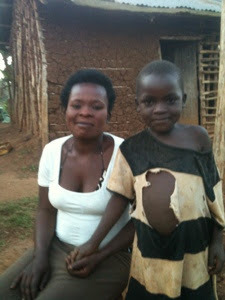 Recently I have been learning so much from my Ugandan neighbors-to-be. I often go up to visit in the late afternoon/early evening to greet them. Sitting and visiting provides opportunities for building relationships, for learning Luganda and for learning culture. I am so thankful for this opportunity that building our house has provided. Our neighbors, like many of the people in the village grow much of their own food. The soil is so rich and the rainfall sufficient to grow things pretty well. I have really enjoyed learning about how food is grown and prepared here in Uganda. One evening I saw my neighbor, Eseza, walking home from the area where she gardens. She was carrying back 6 ears of maize to cook for herself, her children and her father for dinner. She saw me and immediately began to offer me more than half of what she had. I felt so torn. I wanted to be appreciative of the gift, but I also did not want to take what she was going to cook for her family for dinner that night. I did my best to graciously accept one ear explaining that my children don't eat much maize. (The maize here tastes very different from our sweet corn in America.) She handed me the largest and best looking of the ears she had. She seemed so happy to be able to share some with us. The hospitality and generosity that some people have shown to us is so humbling. I have never in my life had to go hungry because I had no food available. I doubt many living in the village of Buundo have had that same experience. It is such a gift to be given food by friends who have worked so hard to just feed their own families. What a lesson in generosity!